Yesterday was the first 80+ degree day this year. What to do? What to do? 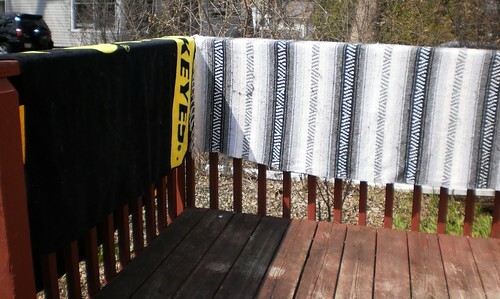 Well, it's a good time to wash lap throws. The three on the settee where Pilchard usually sleeps, were washed and draped over the deck rails. They were dry in 2 hours and smelled so fresh. Now I have to wipe down the inside of the washer to get all the cat hair out of it. I should wash the living room rugs, too, while I'm at it. That's the one thing about a long haired black cat. She's a shedder and even daily combings don't ease the amount she leaves behind. I decided I needed to be outside. I have been cooped up all winter and yesterday was the perfect day to just be. I didn't do yard work. I still need a rake to rake out all the flower beds and rake up the yard. I decided the best use of my time was to sit on the deck and cross-stitch. The girls were allowed out of the house, but they really didn't linger. They were happiest to lie on the kitchen floor at a spot where they could see me. It might have actually been too hot for Pilchard and too windy for both of them. It was quite gusty. But they both got some fresh air. I had worked for an hour on this on Thursday and forgot to take a photo. Here is the result of 3 hours of work yesterday. 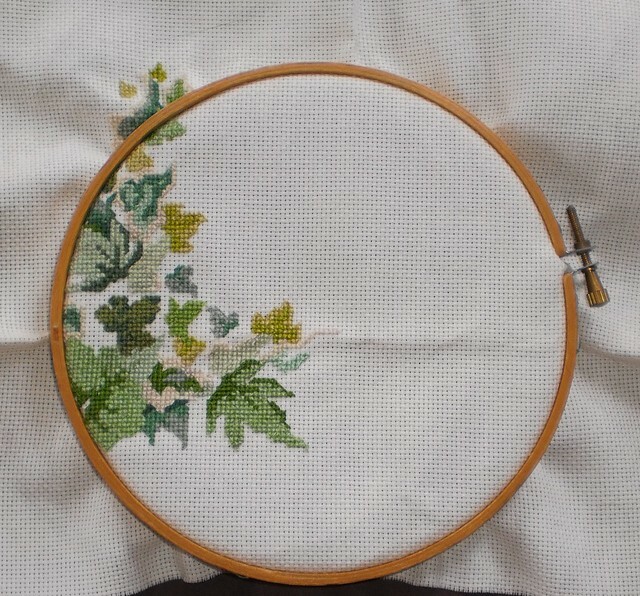 I finished 2 leaves and started a third before I felt I should do some dishes. I have 6.5 leaves left. One good week of stitching really, and it's done. This stitching is day 15 and 16. I still have the house sealed. I thought about taking down the plastic from some of the windows but we could still get snow. The shovels and my boots went into the basement so that means we're probably going to get another snowfall of an inch or more before winter finally leaves for good. The grass exploded in green during the day. My daffodils are blooming as are the hyacinths. The crocus are done for the year. Tulips are up. I am ready to leave this winter behind. Hard to believe in early February, I was dealing with this. Happy Spring. I am so ready.